I upgraded my Mac Book to 10.5.2 today. Everything went swimmingly, but I noticed that everyone I know had suddenly moved their birthday to Wednesday the 13th at 15:00 EST–according to my calendar anyway. My fix for this was to go into the iCal preferences and uncheck the Show Birthdays Calendar checkbox, then recheck it. This put everybody’s birthday back where it was supposed to be. Update 2008-05-29: This birthday calendar weirdness happened again with the 10.5.3 update. Although, only three birthdays got screwed up. Once again, unchecking and then checking the Show Birthdays Calendar fixed the calendars. Update: Here’s a nice weather widget hack that adds the last time the weather information was updated to the widget. 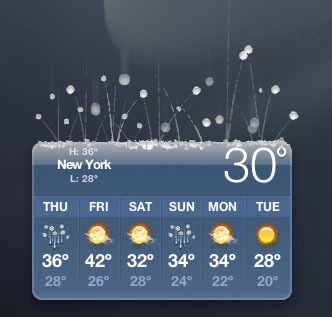 The more miserable the weather, the more extreme the current-weather graphics seem to get on Apple’s weather widget. It’s sleeting here now. Check out the graphic below, it’s so much more exciting than the partly-cloudy image. Recently, I discovered that one can hold a window while switching Spaces in Leopard. The window can then be dropped onto any other space. This, of course, isn’t the only way to move a window to another space. But, I like this better than dragging windows off the screen. Grab the window you wish to move by clicking and holding with the mouse. Switch spaces directly (default: ^ Number Key) or with the arrow keys (default: ^ Arrow Key). Drop the window on the desired space. The movie below shows these steps in action. On my keyboard, using the arrow keys to switch spaces is cumbersome, so I usually use the ^ Number Key combination to switch directly to the space I want. If you can’t see the movie above, you can download the Quicktime file directly. For more tips, take a look at this Spaces tips screencast (the production values are much higher than my Quicktime movie).